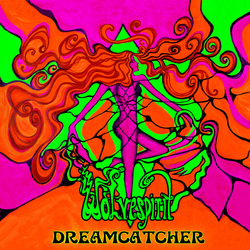 Wolvespirit are a German rock band - with an American singer. The band formed in Wuerzburg in 2009, and the band live together in a house in the German countryside of a small german village with artists, designers and other musicians formed together to a collective. In between this community the creative work flow takes place. Spontaneity apparently plays a big role for WolveSpirit. The music is a blend of Stoner rock and old school 70s rock. Great heavy guitar riffs coupled with superb vocals. At times they are soft and gentle but at others then Debbie lets rip with her full vocal power and then they're more like Janis Joplin. The first single from the album is 'Holy smoke' and that gives a great idea of what to expect from the album - great riffs, great vocals and a really great song. 'Making me wild' is one of my favourites on the album - just a great song. Really though the whole album is extremely strong. If you like your rock with a strong stoner influence then this is definitely one to listen to.